The following diagram shows how the chapters of Revelation relate in a chronological fashion. Revelation is not chronologically sequential as many dispensationalists (e.g. Clarence Larkin, The Book of Revelation, 1919) suppose. 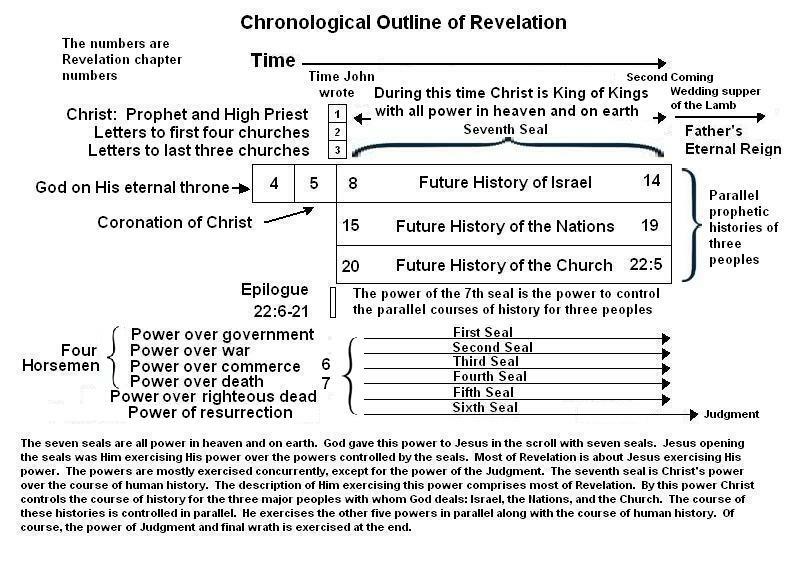 The diagram shows that most of Revelation is about the 7th seal where Jesus exercises His power over the course of human history. The seventh seal has three parallel prophetic histories. These prophetic plans relate to the three major groups of men for whom God has given laws (Rev 8-22). They are Israel (8-14), the nations (15-19), and Christians (20-22). Christ exercises His God given authority over the powers of the seven seals in parallel throughout the time of His reign. He exercises all power in heaven and on earth (Mt 28:18) during the time between the coronation in chapter 5 and the judgment in chapter 20. Chapters 21-22 show Christ victorious and His suffering bride, the church, glorified in eternity. Of course, every Christian is familiar with the truth that God so loved the world that He gave His only begotten Son that whosoever believes in Him might be saved (Jn 3:16). God gave Jesus to die the death we could not die (our death is already obligated in Adam’s curse–to dust all of Adam must return, Gen 3:14, and we therefore cannot die for our own sin) in order that God’s justice might be served and we might live. What is less known is God sacrificed His son Adam (Lk 3:38) in order to bring sin into the world and by having sin as a present fact, to kill sin through the death of Christ. How can this be? Before the world was, God purposed His eternal purpose in Christ Jesus (Eph 3:11, 1 Ti 1:9). God’s plan involved bringing sin into the world, letting it progress till the world perished in Noah’s day, calling Abraham from a world plunging into the darkness of idolatry, electing the Jews, and finally bringing the long awaited Savior of the world. This was God’s plan before the world was (1 Pe 1:19-20, Eph 1:4). Sin was not an accident. From the great comparison Paul makes between Adam and Jesus, it is clear Adam’s sin and the consequent curse that came on the creation was all according to God’s plan (Ro 5:12, 18-19) as much as Judas freewill betrayal of Jesus (Acts 2:23, 1:20, 25). God knew what would happen to Adam when He placed Adam in the garden and forbade him to eat of the tree of the knowledge of good and evil under penalty of death. He knew Adam would eat, and yet God will willing to sacrifice His oldest human son in order that His creation might live. Adam died in order that sin might come into the world, and through sin a Redeemer could die for the redemption of the creation (Col1:20, Ro 8:22, Acts 3:21). However, God has other human sons. These too are condemned to die. “It is appointed unto men once to die, but after this the judgment” (Heb 9:27b). God’s sons suffer affliction in this present world (2 Co 4:17), sometimes martyred, sometimes suffering deprivation, often persecuted, but recognizing their “light affliction, which is for the moment, worketh for [them] more and more exceedingly an eternal weight of glory” (2 Co 4:17). At times they wandered about in sheepskins and goatskins; being destitute, afflicted, tormented; (Of whom the world was not worthy:) they wandered in deserts, and in mountains, and in dens and caves of the earth, but in the end, they all die. Through their affliction they prove their fidelity to God (1 Pe 1:6-8), they are a witness of God to a corrupt world, and they learn patience (Jas 1:3). God sacrifices all of His adopted sons in order that they might glorify Him (1 Co 6:20) and be perfected through their sufferings (Heb 12:11). These suffering, dying sons provided the needy, helpless ones that the Redeemer and Savior might come to save (Lk 4:18-19). These suffering sons are at first the captives of Devil in thrall to death whom Jesus sets free and raises from the dead in order that He might be the firstborn among many brethren (Ro 8:29). I find it interesting to think about the situation in the new earth where God’s sons have risen from the dead, received their inheritance, and rule their kingdoms in glory and honor (Isa 49:22-23, Rev 3:21). They rule while the renewed creation (Acts 3:21) is growing without bounds (Isa 9:7), and while they get thousands of children (Isa 60:22). In one sense God’s sons will be the Adams of the world to come. They are the firstborn ones (Heb 12:23, Jas 1:18). They, like Christ, were faithful till death (Rev 2:10b), and they actually experienced death. In a world of deathless men (Rev 20:4), having experienced death will be quite the novelty, just as we view Adam’s creation from the dust of the earth as a great novelty. Can’t you just hear a wondering citizen of the new earth saying, “My lord Ezekiel, what was it like to suffer on earth and to die?” God’s son can then respond with descriptions of the wonder of God’s grace, the brilliance of His plan, and the glory of His salvation. This salvation is ours for the taking. It only requires sacrificing our all and being faithful till death. Are you up to the task? You can be, through trust in God and faithful obedience to word. How great is God’s love where He sacrificed not only His only begotten Son in order that men might believe and be saved, but God sacrificed all of His sons in order that there could be a sinful world in which the Savior might come and be the Savior of men hopelessly enslaved to sin and death. How great is the wisdom and love of God who doeth all things well. When one reads the Bible, he encounters the terms Abyss or Bottomless Pit, Tartarus, Hades, Hell, Gehenna, and the Lake of Fire. Just exactly what are these? None of these is visible on the face of the earth. The Bible has quite a bit to say about these, and there is additional detail available in the non-canonical works. Some of these terms are synonyms (e.g. the Abyss is the Bottomless Pit), and all of them share the feature of having to do with punishment, but some of them are for time, and some are for eternity. The Bible describes the entities named in the title of this article as literal places, but many or most of them are not understood and are relegated to the status of presumed symbols. I thought it would be instructive to give a brief description of each of them and their relationships to each other. The Abyss (tartaroo) is translated “bottomless pit” in the King James Version (KJV) of the Bible (Rev 9:1, 2, 11, 11:7, 17:8, 20:1, 3), but is translated “the deep” in Luke 8:31 and Romans 10:7. It is a deep crevice in the earth (1 En 88:1-2) and is the place where the evil spirits go when they are cast out of their fleshly hosts to be tormented (Lk 8:31). It is the place where the angels that sinned were imprisoned (1 En 21:7-10). It is a place where God imprisoned “the angels that sinned” (2 Pet 2:4) that Enoch describes being shut up in “the valleys of the earth” (1 En 10:12). The KJV calls the place where the fallen angels were cast “hell” in 2 Pet 2:4, but the Greek word is “tartaroo”. The KJV’s translation of “tartaroo” as “hell” here in 2 Peter 2:4 is one of the three distinct Greek words (“tartaroo” 2 Pe 2:4, “gehenna” Mt 10:28, “Hades” Mt 11:23) the KJV translated as “hell”, and they are all three different places. “Tartaroo” is the deepest abyss of Hades (Strong, G5020), the place where the fallen angels are kept until the day of judgment (Ewing). It is the place into which the souls of the giants, the sons of the angels, are to be cast on the day of Judgment (1 En 56:1), where they will be joined with their fathers (the fallen angels — 1 En 89:24) and the 70 last shepherds of Israel (1 En 89:25). The Abyss, the bottomless pit, and Tartarus are all the same thing. The Abyss while visible from Hades (Lk 16:26, Enoch 21:1-10) is not the same as Hades, being only the deepest part of it. The Abyss is not Torment, Hell, Gehenna, or the Lake of Fire. 1. There is a division for the spirits of the righteous. Like Luke 16:24 mentions, it has a bright spring of water. Some of the former inhabitants of this division participated in the first resurrection with Christ (Mt 27:52). The rest believed Jesus’ preaching when in Hades, and when Jesus ascended to heaven (Acts 1:9), He took these souls to heaven with him (Eph 4:8). This division is now empty, for when righteous men die now, their spirits go to heaven to await the Judgment (Php 1:23, 2 Cor 5:6, 8, Rev 6:9, 1 Th 4:14). 2. There is a division for the spirits whose bodies received burial, but they were transgressors and deserve punishment. These will participate in the bodily resurrection (Rev 20:13). All those who have been buried will be raised from the dead, according to what Jesus promised in John 5:28. Those in this division are in great torment until the Day of Judgment. This division corresponds to the place of torment where the Rich Man is (Lk 16:24). 3. There is a division for those that were slain in the days of the sinners. Genesis 6 describes a time when the earth was so corrupted that the thoughts of men’s hearts was evil continually (Gen 6:5). These were all slain by war and by the Flood (Gen 6:13), and this division seems reserved especially for them. This division may shed light on the strange statement in Revelation 20:13, “The sea gave up the dead which were in it.” If Enoch’s third division of Hades is a cavern under the sea, those rising from this division, would pass through the sea that was the cause of most of their deaths. It seems to be a sort of Davy Jones Locker. 4. There is a division of those who have sinned, but they are distinguished from the transgressors, who seem to be a more hardened version of sinners. I believe these are the ones Enoch describes in Enoch 50:2 who witness the victory of the holy and elect people over the evil and come to believe that Jesus is indeed Lord, and will repent (1 En 50:2). These are the ones of whom Luke speaks in Luke 12:48 that are ignorant of God’s will and who will be punished with few stripes, that is, for a time in Hades and not for eternity in Gehenna with many stripes. Hades is a prison house for the dead (1 Pet 3:19, Acts 2:27) and a place of temporal punishment for those that deserve punishment (Lk 12:48, 16:24). The place of Hades is named after the spirit person, Hades. Hades is a spirit power (Eph 6:12), a person (Rev 6:8) who is over the fortress of Hades (Mt 16:18), the prison place (1 Pe 3:19, Ps 107:10, Micah 7:8-9) of the dead (Acts 2:31). He has substance and form (Rev 6:8) that can be cast into the Lake of Fire (Rev 20:14). He is always linked with the spirit power Death (Rev 6:8, 20:14), an enemy of God (1 Cor 15:26, 55), and Hades will be punished eternally along with the Devil and his angels. Hades is not the same as The Abyss, Gehenna, and the Lake of Fire, although there is a great chasm visible from Hades (Lk 16:36, Enoch 21:7-8) that probably is the Abyss. Haidees (Hades) is one of the three Greek words (haidees, tartaroo, geenna) that the King James Version of the Bible translates as “hell”. However, each of the three words the KJV translates “hell” refer to different places. We have already looked at tartaroo (Tartarus), and Hades is the second of these three words that describe three distinct places. We now turn our attention to the third of these words translated “hell”, “geenna” or Gehenna. Literally, Gehenna is the Valley of Hinnom, a literal valley on the south side of ancient Jerusalem. Today it is a pleasant valley, a tourist attraction, and a park. http://www.flickr.com/photos/tkandell/147503330/ One place in the valley has a sign, “Welcome to Hell”, which while humorous, will not be so funny at the judgment. The reason it will not be funny is that Gehenna is the place of eternal punishment. As you can see from the photo, it doesn’t look like a place of punishment today, but Enoch says that there are fires burning beneath the land (En 67:6-7) that will come up to the surface at the end of the world (En 67:13). The earth will be shaken so violently (Heb 12:26, Ezk 38:20) at the end that the surface of the earth will be altered (Isa 24:19, 30:25, Ps 97:5, Zech 14:4, 10, Ezk 38:20, Nahum 1:5), and the emergence of Gehenna is one of the major changes of the earth that will be effected by His coming. Gehenna is the place of eternal punishment (Mk 9:43) where the wicked are cast (Lk 12:5, Rev 20:15) at the Judgment (Mt 25:41). Gehenna will be visible from the City of God, New Jerusalem (Isa 66:23-24). The smoke from it will rise up forever, and it will be a formidable place. It will extend from south of Jerusalem at the present Valley of Hinnom (Ge-Hinnom, Gehenna) all the way down into Edom that is south of the Dead Sea (Isa 34:5-17, 66:24). The Lake of Fire will have an observation point from which the people can observe the damned (Isa 66:23), but most of the lake will be surrounded by a horrible mixture of briars, nettles, and every noxious plant (Isa 34:13). The land will be inhabited by every kind of noxious bird and beast (Isa 34:11, 14-15). No one will ever pass through there for it will be like the Island of Dr. Moreau times ten. In the New Earth Gehenna is on the surface of the earth at a location that extends from Jerusalem to the southern border of Edom. It will be an eternal feature of the New Earth. It is not the Abyss, the Bottomless Pit, Tartarus, Hades, or Torment, but it is Hell, Gehenna, and the Lake of Fire. Everything that can be said of Gehenna is also true of the Lake of Fire and Gehenna is therefore the same as the Lake of Fire. “Hell” is a word that is used to translate “Gehenna” and is therefore the same as Gehenna. All of the places discussed are places of punishment. Hades/Torment/Hell1 is a temporary place of punishment and incarceration used to keep the spirits of the dead until the Judgment. The place where the righteous were kept was emptied at the resurrection of Christ (1 Pet 3:19, Lk 14:18), and I presume is now empty, for the righteous dead now go to be with God (Php 1:23, 2 Co 5:8-9). The Abyss/Bottomless Pit/Tartarus/Hell2 is a place that serves for both temporal (Luke 8:31, Rev 17:8) and eternal punishment (Enoch 90:24-26). Gehenna/Lake of Fire/Hell3 is a place to be revealed at the end of this present age and is a place of eternal punishment (Rev 20:10, 15, 14:11, Mt 25:41). Nothing is impossible with God, except he cannot lie (Titus 1:2), but he can use agents to lie for him of their own free will (I Ki 22:22), just like He used agents to offer His sacrifice, the Lamb of God (Acts 2:23). God cannot lie, but He manipulates free will agents to do His will (Ex 4:21; Rom 9:13, 18; Isa 44:28), and these agents lie of their own free will (Jn 8:44), so there is nothing God cannot do. It seems it was necessary, or at least best, for God to build a universe where He permitted free will, because otherwise, He would be limited by His own goodness. However, with freemoral agents, He is not even limited by that, and now with God all things are possible (Mt 19:26, Ro 8:28). John 12:27 ¶Now is my soul troubled; and what shall I say? “Father, save me from this hour?” But for this cause came I unto this hour? The death of Jesus had been planned since before the world began. Jesus’ death was the reason for Him coming here. His birth from a virgin gave Him a body free from God’s curse of death on Adam’s seed. His body enabled Him to die. His death paid the legal penalty for sin. His death was adequate for all men, because He was the Creator of all men. His paying the penalty for sin enabled God to be just and yet forgive men. His birth of the seed of David through His mother Mary made Him fit to be heir to the throne of David. His death fulfilled the purpose for this present age which was to make a place where He could die. We men are support players in this greatest saga of the ages. The death of Jesus justifies God in permitting the corrution of the present order. The day of Jesus crucifixion, like Dickens proverbial statement, was the best of times and the worst of times. This day glorious salvation in actuality was worked on the world, but this day the most cruel and wicked of actions was worked among men. The day of the crucifixion justified this present age, and gave promise of glorious days ahead, but on this day sin was at its blackest and God turned His back and turned out His light on a world plunged into the depth of sin. What were they doing? They were executing a condemned man, but who was He? He was the Son of God, the One that had created the universe. They were executing a sinless man. Did they know that? No. But God has mercy on ignorant men. Christ died in order that God could have mercy on men like the ones that killed Jesus. Without Christ’s death, even ignorance was not excusable. With the blood of Christ, even sinful men can now be punished with few stripes (Lk 12:48), and God can still be just. Since Jesus has planned this event from the foundation of the world and put those men into their situation where He might be expected to have mercy, it was still hard for Him to do what He did. The pain was real. The loss was great. Death was still to be shunned. ohn 19:25 Now there stood by the cross of Jesus his mother, and his mother’s sister, Mary the wife of Cleophas, and Mary Magdalene. 26 When Jesus therefore saw his mother, and the disciple standing by, whom he loved, he saith unto his mother, Woman, behold thy son!27 Then saith he to the disciple, Behold thy mother! And from that hour that disciple took her unto his own home. Jesus’ father Joseph appears to have died between Jesus’ 12th year and his 30th, for though Mary and Jesus’ fleshly brothers appear in the gospel narrative of Jesus’ ministry (Mk 3:32), Joseph never does. Since Joseph had adopted Jesus as his own son, when Jesus died, He was legal heir to the throne of David, which, in accordance with prophecy (Amos 9:11), had fallen into serious ruin and He was supposed to raise up, but at the time of this utterance, it appeared impossible that He would fulfill this prophecy. He was not only still without the throne of David, He was dying and taking His support away from His mother. Since Jesus was the oldest son, He was responsible for supporting the family. Fittingly enough, Jesus does not transfer that responsibility of caring for His mother onto His unbelieving brethren (For not even His brothers were believing in Him—Jn 7:5). He transfers the responsibility for His mother to a fellow believer, the disciple whom Jesus loved. Jesus protects those that believe in Him. At this point in Jesus’ ministry, unbelievers might point to His death as a failure to fulfill many prophecies. He was no warrior king as the prophets demand. He had not restored the house of Jesse. He had not introduced freedom, peace, and prosperity to Israel, but had instead brought a sword (Mt 10:34). The peaceful Jesus brought a sword and discord among the people. The warrior Jesus with His sword brings eternal peace. At first both thieves reviled Him, but one, witnessing the behavior of Jesus and the world plunged into supernatural darkness thought better of his behavior as he drew closer to having to face God. 43 And Jesus said unto him, Verily I say unto thee, To day [Now/As of this time] shalt thou be with me in paradise. This thief was dying and Jesus was dying, but this dying thief has faith enough to say, “Remember me when thou comest into thy kingdom.” The thief said this in the face of the fact that all of Jesus disciples forsook Him and fled, and none of them was around the cross but Jesus’ mother and John. The thief made this statement in the face of the fact that both he and Jesus were dying, and the only way for Jesus to fulfull the thief’s request was for both of them to rise from the dead. The thief’s faith shows the truthfulness of Jesus’ statement, “The publicans and the harlots go into the kingdom of God before you” (Mt 21:31). While Jesus, an innocent man, was dying, He had room in His heart for the plight of others. He was not wrapped up in bitterness and self-pity like so many become when calamity comes their way. Jesus came into the world to save sinners, and He had time for sinners as He died on the cross. Jesus died to save sinners (I Ti 1:15), the sinners of the whole world (II Co 5:14-15). That was the reason He came into the world. God prepared a body for Him (Heb 10:5) in the womb of Mary in order that Jesus, the creator of men, might die for His creation, but not all will be saved, for God also gave men free will, and some exercise that free will to disobey God. What is “today”? And where is Paradise? Jesus’ statement about Paradise has caused a great deal of confusion because people think Jesus meant He was going to heaven when He died. However, Peter says that Jesus went to Hades (Sheol) after His death (Acts 2:27). Is Paradise in Hades? Hades is the dark and gloomy (Micah 7:8, Isaiah 42:7) unseen place of the dead (1 Pe 3:19) located in the nether parts of the earth (definition of Sheol, H7587, Strong’s). Paradise is in the City of God, New Jerusalem. After Jesus arose from the dead, He said He had not yet ascended to His Father who is where Paradise is, so Jesus did not go to Paradise when He died. If Jesus did not go His Father, neither did the thief. What, then, did Jesus promise? Obviously, Jesus promised the thief that the thief would go to Paradise “today”, but what does “today” mean? To harmonize Jesus’ statement with what happened, “today” must mean “now”, “now you will be with me in Paradise”. Because of the thief’s belief, at that time salvation had come to the thief, and He would be with Jesus in Paradise at some future time. Salvation by faith only? Many people teach this, but the thief died under the Law of Moses. Jesus did not give His law until the day of Pentecost when He told believers to “repent and be baptized for remission of sins” (Acts 2:38). Salvation is not by anything “only” (James 2:24). Many things work together to accomplish salvation—faith, repentance, confession, the blood of Christ, the grace of God. The salvation of the thief was Jesus acting as the Son of God. As God in the flesh, Jesus forgave several people during His ministry ( to show that He was the Son of God. He did no more on this occasion than He had done on several others. When Jesus arose from the dead He ascended back to the Father. Then He was given all power in heaven and on earth (Dan 7:13-14). By that authority He now commands men to be baptized in the name of the Lord (Acts 10:48). Baptism is Christ’s command to us that saves us (1 Pe 3:21), puts us into Christ (Rom 6:3), and makes us to walk in a newness of life (Rom 6:4). As He tells us to do, Christ is looking beyond the present time to the glory that shall be revealed. This life is not all there is. All debts are not settled today. Matthew 27: 45 Now from the sixth hour there was darkness over all the land unto the ninth hour. This dark and evil day was the culmination of God’s purpose for this world to create a sacrifice and remedy for sin, this despairing cry of Christ was recognition of His payment for sin and His thereby suffering an eternal loss. At this hour Jesus gave up forever complete equality with God. Christ’s humiliation extends through eternity where He Himself is eternally subject to God (1 Cor 15:28). God accepted His sacrifice where Jesus was made to be sin for us (2 Co 5:21), and raised Him up from complete separation from God to be God’s Chief ruler (Php 2:9). Jesus took our stripes upon Himself (Isa 53:5). The alienation from God that was justly ours, He, as our creator bore for us. Luke 23:44 ¶And it was about the sixth hour, and there was a darkness over all the earth until the ninth hour. Notice it was not Jesus’ thirst that concerned Him, but God’s word. His own desires, yes, even His needs, were secondary to honoring God’s will even when death was imminent. While He was dying, He was still concerned that God’s word be true. Mere moments before His death, He fulfilled a pending prophecy that God may be true. Death is the separation of the body and the spirit. When Jesus died, His body was dead, because His spirit left it (Jas 2:26). His spirit, however, did not cease to exist. The spirit is eternal, because it is made in the image of God (Gen 9:6). At death, the spirit leaves the body, and thereafter continues to exist in a state of awareness (Lk 16:22-31). Annihilation of the spirit and soul sleep at death are both wrong (Rev 6:10, 1 Sam 28:14-19). Peter says Jesus spirit then went to Hades (Acts 2:27). Jesus’ faith sustained Him in the hour of the valley of the shadow of death, He did not fear evil (Ps 23:4). By His death, Jesus paid the price for sin, and satisfied God’s sense of justice. Because Christ died the death men could not die because their death is obligated, and because He was Creator of all men, and because He was sinless, His death was necessary and sufficient for all men of all ages. The continuity of Jesus with His creation is not only necessary for men who died before He was born, but it is necessary for all those who might sin in the world to come. Many guesses have been made regarding what Jesus meant by this statement, because no one knows for sure what is the antecedent of “it”. That thought was locked inside Jesus’ head, and He did not tell us. In my opinion, He meant that by His death the creation was finished, for by His death He created an entirely new thing—an eternal solution for sin. The creation was finished when Jesus laid the capstone of Himself, the Creator, dying for His creation. Jesus’ utterances as He hanged dying on the cross give great insight into the pure soul of the Lamb of God dying for the sins of the world. Thanks be to God that He willing to send His Son to die the death we could not die and thanks be to Jesus the Messiah for being willing to be the Lamb of God. 25 I thank God through Jesus Christ our Lord. Are There Three Classes of People at the Judgment? At the Judgment, all the nations are gathered before Christ (Mt 25:32), and He commissions His brethren (1 Cor 6:2) to separate the nations into two classes: the sheep (the approved) and the goats (the condemned). Christ pardons the sheep (Mt 25:34) and consigns the goats to torment (Mt 25:41, 46) after His brethren have finished the separation into the groups of the sheep and goats. This shows that there are three classes of people at the Judgment: the lost, the nations, and the elect brethren of Christ. The logic of Christ’s promise to the faithful that they will rule with Him (Rev 3:21) requires that a servant class must exist. Likewise, the five foolish virgins simply being locked out but not punished implies they will be in a servant class in eternity (Mt 25:12). The one talent man simply having his talent taken away from him (Lk 19:24), but not being punished further implies he will be relegated to the servant class. The ignorant man that did things worthy of stripes, but who was only punished with few stripes (Lk 12:48) implies there is forgiveness for some sinners at the judgment, for the punishment of some is limited to a temporary punishment of few stripes, but an outcome where punishment is temporary is different from what happens to the wicked among the nations at the Judgment who are told, “Depart from me, ye cursed, into everlasting fire” (Mt 25:41). These people with few stripes also suffer temporal punishment after death in Hades (Lk 16:24, 28), but their outcome is different from the sons of God that go heaven when they die (II Cor 5:8-9, Php 1:22-23). These differences imply there is a servant class in eternity. The Bible deals mainly with how to become a Christian and how to please God, and so it is understandable that the two-state theology (you go either to heaven or hell) has emerged, because there is no instruction given as to how one might choose to be only good enough to just inherit the earth. Given the fact that Christianity generally teaches a two-state theology, that limited outcome causes men to question the justice of God and in an attempt to justify His punishing ignorant sinners, it causes men to question the literal reality of hell. Among believers who wonder about God’s justice in condemning the ignorant, you often hear the question, “But what about those people that never heard about God?” If you accept a three eternal destinies theology, it satisfactorily answers the question of “what about those that never heard”. The righteous shall be victorious in the name of the Lord of Spirits: And He will cause the others [those that are not the righteous] to witness (this) That they may repent And forgo the works of their hands. For His compassion is great. And in the presence of His glory unrighteousness also shall not maintain itself: At His judgment the unrepentant shall perish before Him. The Bible teaches the three state theology, but it is subdued, because you cannot consciously choose to just be good enough to inherit with the nations (the sheep, Mt 25:34). God’s grace places men among the sheep, and an individual cannot determine the miniumum amount required to receive just enough grace to inherit the earth, and even the effort to do so might prove fatal to the plan (Mt 25:25-30). The sheep are those that failed to do good enough to inherit with God’s sons (Mt 25:12), and those that knew not the master’s will, but did things worthy of stripes (Lk 12:48) and who are willing to believe when they find out better (1 En 50:2). Paul also implies the three-state theology when He says, “Do ye not know that the saints shall judge the world?” (I Cor 6:2). Jesus likewise implies it when He says, “To him that overcometh will I grant to sit with me in my throne” (Rev 3:21). Obviously, Christ and the elect must have subjects over whom to rule. In the world to come, the kings of the earth (the elect, 2 Ti 4:8) are permitted entry into New Jerusalem (Rev 21:24), but the saved of the nations may not enter into it (Rev 21:24). John admonishes his readers to so live that they might receive a full reward. He implies it is possible to receive a reward that is less than full (II Jn 1:8), which would imply that some just receive a lesser reward, such as inheriting the earth. Matthew 25:31-46 speaks of the Judgment of the nations. In these verses the nations are judged. Someone separates the nations into two classes: the sheep, and the goats. Jesus then addresses the sheep and bids them enter His kingdom based on their kindness they showed toward Him. The sheep reply they don’t remember ever seeing Him. He then replies, “Truly I say unto you, Inasmuch as ye have done it unto one of the least of these my brethren, ye have done it unto me.” In this verse are three entities: “I”, “you” and “these”. You can see the situation Jesus describes in pictorial form in the diagram. The picture shows that while there are two destinies for the nations, there are three possible destinies for those that would serve God. Matthew 25 describes all five possible conditions, and these conditions are illustrated in the drawing. By having three eternal destinies, you explain how the elect are said to rule when Jesus has promised all of the elect that they will receive the reward of being rulers (II Ti 4:8), because the elect will have the nations over which to rule. The three eternal destinies solution also explains how God can be just and save people that never even heard of Him until He comes again (Rom 3:26, En 50:2). If they believe in Christ when He comes and are willing to repent, God will grant them grace, but no glory (1 En 50:2-3). It works much better than the two-state theology, and it is more faithful to the scriptures. As the text is laid out in Revelation, the events described there are not in chronological sequence. 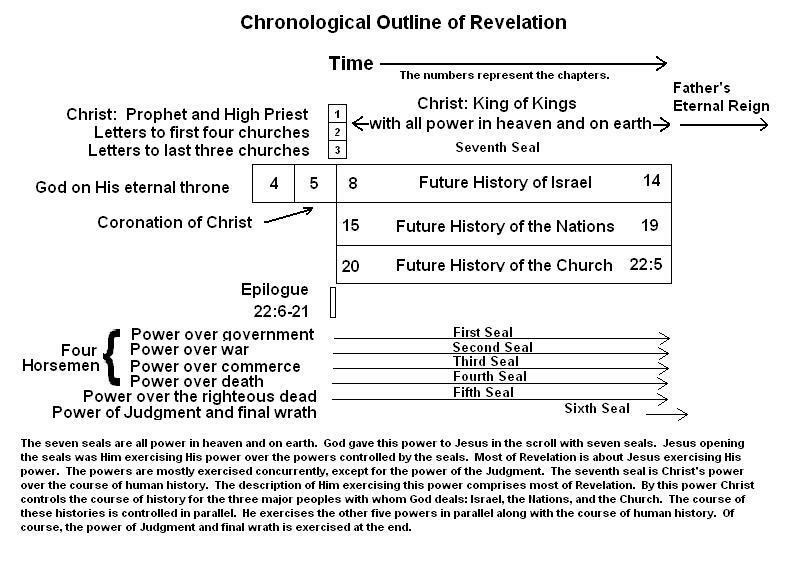 This diagram attempts to outline the major sections of Revelation in a more chronological sequence of events. The major portion of Revelation (Rev 8-22) is Christ exercising His power over the 7th seal, His control of the course of human history.